MIAMI - A Florida teen is accusing a university police chief of choking him during a recent confrontation. 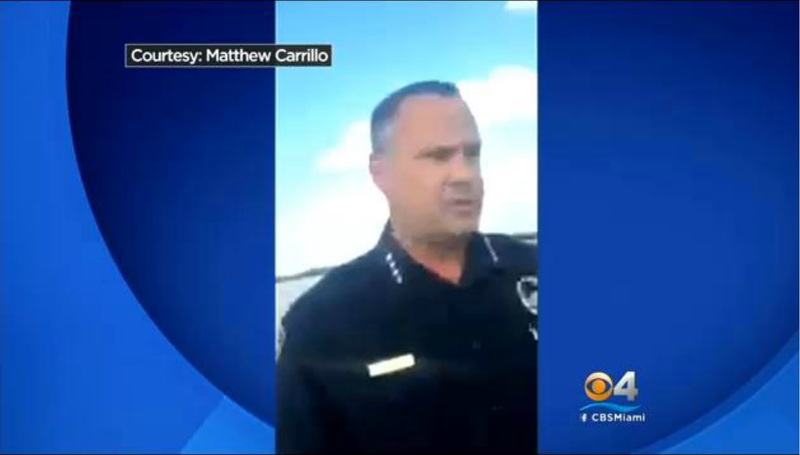 Matthew Carrillo told CBS Miami that Florida International University Police Chief Alex Casas confronted him along with his friend, Javier Palacios and another friend at a campus garage where the trio were skateboarding on Sunday May 10. Carillo says the confrontation began as a warning about trespassing -- the teens are not students at the college -- but ended with Casas pushing and choking Carillo. "He put his arm across my chest...and with his other hand he put it on my neck and he was like pushing me up against the wall," Carrillo told CBS Miami. Carillo says when the chief let him go, he recorded the rest of the encounter on his phone. "Once I started taking the video, his tone immediately changed" said Carrillo. Chief Casas appears very calm in the video, responding to questions from Carrillo and his friends and denying their assertion that he had just choked Carrillo. Casas turned down requests for an interview, but said in a police report that he "placed his hand and forearm on (Carillo's) upper chest." In the report, Casas says he was concerned for his safety when Carillo "proceeded to stand up, grabbing the skateboard behind his back." Carillo denies that he grabbed his skateboard. His side of the story is supported by friend Javier Palacios, who witnessed the incident. "He came up to us with unnecessary force toward Matthew, and he pretty much just choked him around the neck....With that arm he had him pretty pushed up against the wall," said Palacios. Florida International University released video from 17 surveillance cameras to CBS Miami, and none show a clear view of the incident. The only close-up angle available shows Casas talking to the young men, but then jumps forward two minutes and thirty seconds, as the chief and the teens can be seen parting ways. The other videos have much smaller jumps, or are simply too far away to get a clear picture, reports CBS Miami. Miguel Amador is representing the Carrillo family and calling for outside investigations into the incident. "I find it to be a little bit coincidental, if you will, that there seem to be large gaps that are missing in the videos that were provided by FIU and the FIU police," Amador said. CBS Miami has asked FIU since receiving the videos Tuesday afternoon to explain the jumps in footage, and to confirm that none of the videos has been edited. A spokesperson says they are still working to find answers to those questions. The school's senior vice president and CFO Kenneth Jessell expressed support for Casas in a statement. Jessell also indicated he has offered FIU's full cooperation if the State Attorney or Florida Department of Law Enforcement investigates.